Cu-based chalcogenides have received increasing attention as promising thermoelectric materials due to their high efficiency, tunable transport properties, high elemental abundance and low toxicity. In this review, we summarize the recent research progress on this large family compounds covering diamond-like chalcogenides and liquid-like Cu2X (X=S, Se, Te) binary compounds as well as their multinary derivatives. These materials have the general features of two sublattices to decouple electron and phonon transport properties. On the one hand, the complex crystal structure and the disordered or even liquid-like sublattice bring about an intrinsically low lattice thermal conductivity. On the other hand, the rigid sublattice constitutes the charge-transport network, maintaining a decent electrical performance. For specific material systems, we demonstrate their unique structural features and outline the structure-performance correlation. Various design strategies including doping, alloying, band engineering and nanostructure architecture, covering nearly all the material scale, are also presented. 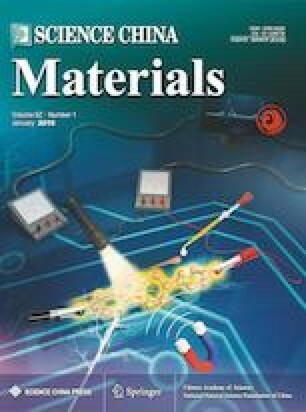 Finally, the potential of the application of Cu-based chalcogenides as high-performance thermoelectric materials is briefly discussed from material design to device development. Tian-Ran Wei is an assistant professor at Shanghai Institute of Ceramics, Chinese Academy of Sciences (SICCAS). He obtained his PhD degree in materials science and engineering from Tsinghua University in 2017. His current research focuses on advanced thermoelectric materials and the underlying transport mechanisms. Xun Shi is a Professor in SICCAS, China. He received his BSc (2000) in Tsinghua University and PhD (2005) in the University of Chinese Academy of Sciences. He worked at the University of Michigan (USA) as a postdoctor from 2007 to 2009. Then he joined the R&D center in General Motors. At 2010, he came back SICCAS. His current research focuses on advanced thermoelectric materials. 铜基硫族化合物因其高性能、可调的输运性质、高丰度和低毒性, 被认为是很有前景的新型热电材料, 引起了研究者的广泛关注.本文总结了近年来铜基热电材料的研究进展, 包括类金刚石结构材料、声子液体二元及多元化合物等. 本文首先总体介绍了两套亚晶格的基本特征及其对热学、电学性质的影响: 一方面, 复杂晶体结构和无序、甚至液态化的亚晶格导致极低的热导率; 另一方面, 刚性亚晶格构成电荷传输通道, 保证了较高的电学性能. 然后, 本文针对特定的几类材料体系, 详细介绍了其典型结构特征与“结构-性能”构效关系, 以及掺杂、固溶、能带结构调控和纳米结构设计等多尺度优化手段. 最后, 本文从材料研发和器件研制的角度评述了铜基硫族化合物作为热电材料的应用前景及相关进展. This review is supported by the National Key Research and Development Program of China (2018YFB0703600), the National Natural Science Foundation of China (51625205), the Key Research Program of Chinese Academy of Sciences (KFZD-SW-421), Program of Shanghai Subject Chief Scientist (16XD1403900), Youth Innovation Promotion Association, CAS (2016232) and Shanghai Sailing Program (18YF1426700).